The next installment of the Sailor Moon Saga is here and this time Sailor Moon might be getting some more help. Two new guardians have shown up and no one really knows what to make of them. Sailor Neptune and Sailor Uranus mysterious appeared and don’t look like they’re going to help the Sailor Guardians anytime soon. A new enemy has appeared as well looking for pure heart crystals as well as talismans that are inside these pure hearts. Who knows where these new enemies came from and what do they have planned for the pure heart crystals? Also who are these new guardians and why don’t they seem too keen in helping the Pretty Guardians? The Blu-ray/DVD combo pack comes with six discs, three Blu-ray and three standard discs. The DVD also has a well-put together menu like all the Blu-rays in the Sailor Moon series do. You can pick what episode to watch, you can set the captions that will appear on screen, you can see trailers as well as an illustration gallery for the series. These features are pretty straightforward and on the last disc, there’s an interview with the English cast of the series, which is something I like seeing and hearing. It’s always interesting to hear the cast talk about their experiences and how they interact with each other. It’s also interesting to put a human face to the voice of the characters and this allows the fans that aren’t familiar with the cast to do so. Another feature that comes with the Blu-ray pack is a special book that gives character bios as well as descriptions of each episode in the Sailor Moon S saga. It also has special illustrations as well as the cast breakdown of who plays what character. It also comes with a display box to hold this box set as well as the next box set. It’s interesting to see this saga uncut because I can remember growing up and this saga was edited poorly. The main issue/censorship from this saga was that Neptune and Uranus were a couple and in the old days of editing, they were cousins, I believe. It’s neat to see how the animated series were supposed to be all these years later and we have uncut series to thank for that. Watching the series now, I don’t know how this was even edited since the idea of Sailor Neptune and Sailor Uranus being a couple is rampant throughout the episodes. I know this will shock you but the world is doomed and it’s up to Sailor Moon and the Guardians to stop the threat. Stop me if you’ve heard this one before! The writing is pretty good and has some humorous story lines like when Usagi drinks the wrong drink at a fancy party and gets drunk. She was worried that she wouldn’t be able to sound mature/fancy enough and then gets drunk and if we know anything, being drunk will solve that fancy sounding problem. 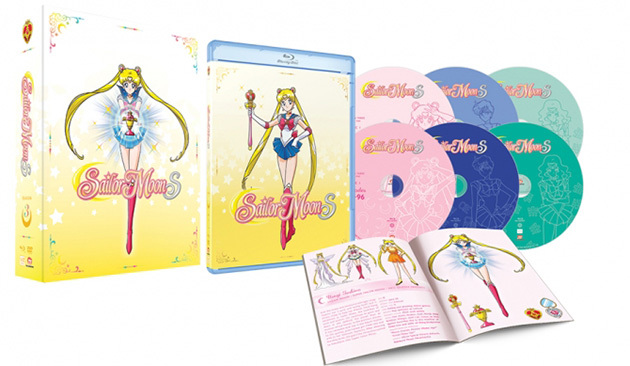 Fans of Sailor Moon will want to get this Blu-ray/DVD combo pack and will thoroughly enjoy the booklet that comes included with the box set. Fans might be able to learn something new or get a new insight of the series from reading the booklet. I’m giving the Blu-Ray Sailor Moon S box set a 9/10. I would like to thank Viz Media for the DVD review copy.